Vancouver Challenge Cup 2016 | JC Dance Co.
It’s been over a month since the Vancouver Challenge Cup (VCC), my 3 year old baby, was held. For those of you who don’t know, VCC is a 2-day spectacular that actually, just like a baby, takes 9 months of incubation to produce! It’s been awhile since the event, but even one month later, I am still hearing people sing praises about how unique and fun VCC was! 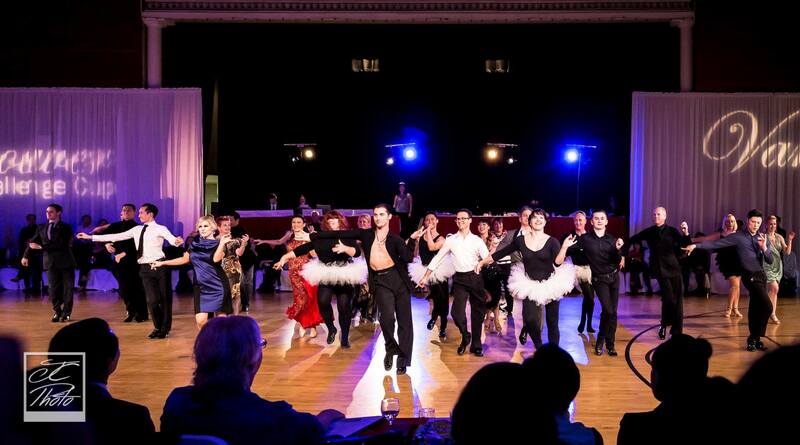 Some even said that it’s the best ballroom event that Vancouver has to offer! You don’t know how amazing that makes me and my co-organizers feel! I’m so proud that all of our hard work paid off. Best of all is that we achieved our mission to bring the joy of dance not just to the competitors and spectators, but to everyone involved in the whole event. Our new addition this year of the “Pro-show” was a huge success! We had a mix of serious shows from some of our local Pros, including a Tango by your truly, a comedy ballet (which had people rolling in their seats laughing) and a grand finale with all of the Pros involved in the event (even the judges). It was truly a great spectacle for everyone and a whole lot of fun for us Pros, who are too busy coaching to strut their stuff these days! What also made our event unique was our annual Mixer (a two-step this year), our Team Match competition on the Friday night (which featured some National Junior & Youth finalists), and our Jack & Jill events (in which several pros entered for fun)! In case you missed the event, here are some “not to be missed” video clips of our Pro-show. Make sure you don’t miss out next year!